Put a cherry into a chilled martini glass. 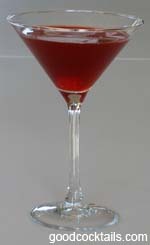 Cover the cherry with grenadine. Mix the remaining ingredients with ice and strain onto the grenadine.